2019 Cadillac XT4 Trim Levels with Comparisons & Configurations. What 2019 Cadillac XT4 Trim Level Should you Buy? What is the Difference Between Trims? The 2019 Cadillac XT4 is a compact crossover SUV. It comes in a four-door configuration with a rear lift-gate for access to the main cargo area. All versions of the Cadillac XT4 can seat up to five people. Crossovers are increasingly dominating the automotive market today. They offer much of the utility and functionality of a large SUV but in a smaller, more convenient package. The XT4 offers a great mix of performance, function, style and luxury. At the heart of the Cadillac XT4's performance is a four-cylinder turbocharged engine. This power plant produces 237 horsepower and 258 pounds-feet of torque. You get plenty of power and brisk acceleration with this engine. It runs smoothly and quietly too. You won't be plagued by vibrations or engine noise even at the highest of speeds. It never feels sluggish, either, even when your Cadillac XT4 is loaded down with passengers and cargo. The Cadillac XT4 engine is paired with a nine-speed automatic transmission. This system features overdrive and an auto-manual feature so that you can manually cycle through the gears when you need to. This crossover SUV comes in front-wheel drive and all-wheel drive variations. With the available all-wheel drive, you get a huge boost in traction and in off-road performance. It makes the XT4 a good performer in just about any weather conditions. All-wheel drive versions of the Cadillac XT4 get around 22 miles-per-gallon in the city and 29 miles-per-gallon on the highway. The front-wheel drive variations offer slightly better fuel economy. With front-wheel drive, you can expect around 24 miles-per-gallon in the city and 30 miles-per-gallon while driving on the highway. This small SUV has a cargo capacity of 22.3 cubic feet with all of the seats in use. When the rear seats are properly configured, this can be extended to 48.9 cubic-feet of storage space. The Cadillac XT4 may be a luxury vehicle, but it can go off-road if you need it to. It can also tow between 1,285 to 1,490 pounds when properly outfitted. This gives you a lot of options that some luxury-oriented vehicles may not offer. The XT4 can be used to take a boat or trailer along on long trips and even for adventures that take you off the beaten path. There are two main reasons to choose a Cadillac over some other brand of crossover SUV. First, you're going to get superior engineering and craftsmanship. Secondly, you'll get some outstanding luxury features. You get three different trim levels to choose from with the XT4. Since all three have the same engines and basic performance specs, the trim levels are more about the convenience and luxury features. We will take a look at each of these trim packages and how they compare to each other. 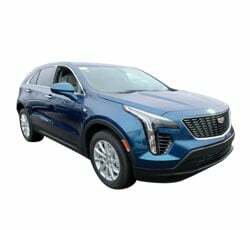 Compare the 2019 Cadillac XT4 Luxury vs Premium Luxury Trim Levels. What is the difference? All three trim packages come in the same eight color choices. Both the Luxury and Premium Luxury trim levels share some common performance features. They both have Start/Stop Technology. This means that under certain conditions, the engine will turn off when you come to a complete stop. With any XT4 you'll get four-wheel anti-lock brakes. Electronic power steering and an electronic parking brake are standard. You'll always get Hill Start Assist and Intelligent Brake Assist as well. The Luxury trim comes with a set of 18-inch, 10-spoke alloy wheels with a Bright Silver paint job. The Premium Luxury gives you the same size and style but with a Pearl Nickel finish. The wheels are equipped with a set of all-season tires for both trims. Both also give you a compact spare wheel and tire. The two trims provide automatic headlights, but the Premium Luxury adds on a feature called Tunnel Detection. It's exactly what it sounds like and detects when the lights need to go on and off as you go through dark underpasses. There are some cosmetic difference on the outside of the XT4 for these two trim levels. The mirrors and door handles are painted to match the body color on the Luxury trim. The exterior mirrors offer a heating feature for both trims. The Premium Luxury adds on a power-folding feature. This trim also allows you to have integrated turn signals installed as an option. Both of these trim packages provide LED headlights, taillights, turn signals and daytime running lamps. The Premium Luxury gives you a power-operated lift-gate and illuminated door handles. You can get a number of optional packages for both trims. Some of these include an all-weather package, a sunroof and a floor liner. The Premium Luxury gives you some additional choices like the Comfort and Convenience Package or the Comfort and Technology Preferred setup. These additional options for the Premium Luxury give you some new perks like upgraded seats, ventilation for the seats, an improved instrument cluster and wireless charging for your portable devices. The Premium Luxury trim level also gives you access to a driver-assist package that you can't get on the regular Luxury trim. This adds on Forward and Reverse Automatic Braking, Adaptive Cruise Control, Lane Keeping Assist and Forward Collision Alert. You also get extra sensors to warn you of nearby pedestrians. The stock driver's seats for both trims are eight-way power-adjustable seats with lumbar support. The passenger's seat gets only six adjustments. The rear seat has a 60/40 split folding feature for more cargo space. Both trims come with an eight-speaker audio system and eight standard airbags. Both trims offer dual-zone climate control. Lane-Change Alert and a Blind-Spot Monitor is standard on the Premium Luxury model only. You get the same infotainment system here no matter which of the two trim levels you pick. You can connect devices via Bluetooth or USB port. In the rear-cargo area, the Premium Luxury gives you an added shade feature. This allows you to cover up your cargo so that it can't be seen by prying eyes. All trim levels of the XT4 get Cadillac's Teen Driver System. This system allows you to set parameters for the younger drivers in your household. It also allows you to monitor their driving habits. You also get StabiliTrak, an electronic stability-control system with traction control. For the most part, the standard safety features are the same for the Luxury and Premium Luxury trims. The main differences being the aforementioned, optional packages you can tack on to the Premium Luxury. Compare the 2019 XT4 Premium Luxury vs Sport Trims. What is the difference? When you move up to the Sport trim, the first thing you may notice is the redesigned, sportier grille. The roof rails for this trim get the glossy-black paint treatment. The window molds are matched with this glossy black finish as well. The Sport comes equipped with 18-inch alloy wheels and the same 10-spoke design as before. This time you get a Diamond Cut, Argent-Metallic finish. This trim also gives you come additional options for choosing larger wheels. Many of the feature highlights are the same between these two trim packages. Both get keyless entry and remote-start features. Both share the same eight-speaker sound system. The Sport model includes some new touches like a leather-wrapped steering wheel and alloy sport pedals. The seats are almost the same, but the Sport package gets you four-way lumbar support while the Premium Luxury only has two-way lumbar adjustments. The Sport model also adds a power seat-back bolster for the driver and front passenger. You can add a sports suspension to the Sport trim level as an option for an extra fee. All of the safety features and driver-assist system that are standard for the Premium Luxury model are present on the Sport trim. All of the optional add-ons are the same for both trims when it comes to the safety features too. It's a safe bet that you won't be disappointed with any of the trim levels for the 2019 Cadillac XT4. They all offer the same great engine performance and driving dynamics. All trims give you ample room for passengers and cargo. The standard Luxury model comes loaded down with a good amount of features and equipment. One of the best things about choosing a trim package is that there isn't too much of an increase in price between the three levels. Before choosing a trim, you will need to decide on whether you prefer front-wheel drive or all-wheel drive. This should be an easy decision. The all-wheel drive models give you better traction and improved performance in rough weather. They also allow you to take your Cadillac XT4 off road if you should ever need to or want to. When it comes to the trim packages, the Premium Luxury model will be the best buy for most drivers. You get the top-tier audio and infotainment systems with this trim package. You don't really gain any safety or security features by moving up to the Sport package. Mostly, you'll see a few more perks in the comfort and convenience department. Many of these won't be missed by the average driver. The Premium Luxury trim is your best all-around value.